Hello! We are Richard and Rie Roberts of Oak Harbor, WA. We are very lucky to have Johnny as a member of our small family! Although this is the first Springer that we have had, I must say that we only wished we would have found him sooner! Johnny is the most loyal and loving dog a family could ask for. He is smart and very quick to learn new things, very obedient and easily trained. We are not dog trainers but have found that with Johnny it's very easy, he is completely house trained and he wastes no time to let you know when he needs attention! He is also quick to let you know when someone's at the door and sticks around to make sure it's safe!! When Johnny's away on "show duty" it's kind of quiet around here, but when he returns....he acts like he never left. He also loves to go to Home Depot, it could be because the staff feeds Him treats and it's funny how he "knows" the staff....maybe he can identify the uniforms they wear?? ?, he just goes right to them. We have also been blessed with keeping Sassy on occasion and she is just a sweetheart, much the same as Johnny but she thinks she is a lap dog!! 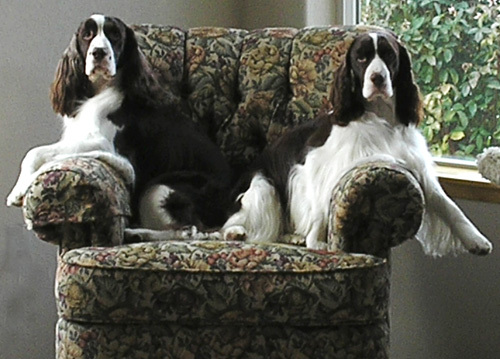 Since my wife and I have met Mary and Ric of Mar-Ric Springers, we have felt like one big family, every time we visit their home it's hard to leave without taking another Springer...so stop by and add one (or two) to your family!! Thank you Mary and Rick for sharing Penny and Abby with us. They are beautiful girls and their fantastic temperaments and, not to boast too much, beauty, is a real testimony to their wonderful breeding. The care you gave them as little puppies has shown in their development both, physically and mentally. The show bug has hit us again! Abby finished her championship with ease and now will start working on her CD. I think she is destined to be a therapy dog with her kind, loving temperament. Penny's athletic ability and quick mind is sure to make her a star in Rally and Agility. She loves everybody and everything and is one of the most willing dogs we have ever owned. Watch for her at the shows this summer! I thought I would let you know how Molly is doing, she is such an angel. I can't say enough good things about her. 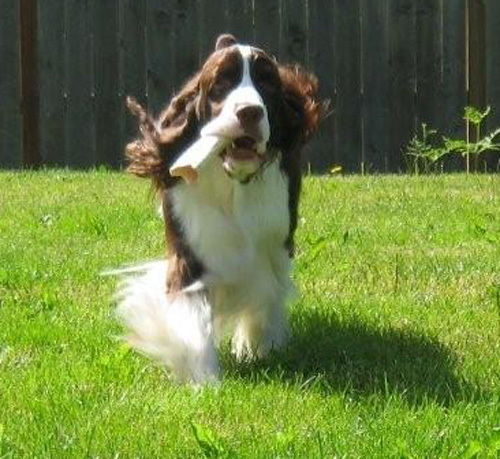 Molly has the best temperament and personality for an English Springer Spaniel! She is always wagging her tail and making me smile. I think she is going to be a natural show dog. Molly is so smart and sweet! She is going to be a great obedience dog she is a very quick learner. She always lets me know when I need to take her to go potty. When I take her out to go potty she loves to find something to carry in her mouth and prances around the yard like a little show off:) I love her so much!! She is the perfect pet for me. I'll keep you up dated on her in the show ring, she's going to do great. Thank you for being so easy to work with. We have had a wonderful experience with Mar-Ric kennels and an even better experience with our new English Springer Spaniel. She is more than we'd hoped for, beautiful and an instant member of our family. All of the people at Mar-Ric kennels are very professional, knowledgeable and lovingly committed to their dogs. And of course, their championship bloodlines and good breeding leads not only to great show dogs but to excellent temperaments and great companions also. 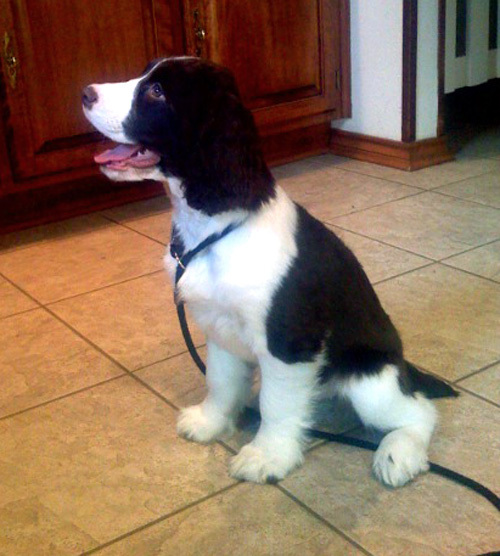 We love our English Springer Spaniel and Mar-Ric kennels.